Canon's CarePAK PLUS promotion – with protection from kids, pets, and life including accidental damage such as drops, spills, power surges and other unforeseen events – is coming back. The new promotion period will run from May 1, 2016 to July 31, 2016. How do we know the promotion is coming? Yesterday Canon USA released a CarePAK PLUS promo video on their YouTube channel with the dates "05/01/16 - 07/31/2016" appearing at the end of it. However, after originally embedding that video into this post, its permission level was suddenly set to Private (and therefore unviewable). So which products will be eligible for the CarePAK PLUS coverage? Well, we're not 100% sure yet (the marketing representative I spoke to at Canon did not have that information yet). Below you'll find the cameras and lenses which qualified for the previous CarePAK PLUS program, and it's probably a safe bet that they'll be covered in the new program as well. We assume the EOS-1D X Mark II and 80D will also be included in this promotion, but that's just speculation for now. In addition, lenses included with eligible body were covered. For example, if a customer purchased the Canon EOS 5D Mark III and EF 24-105mm f/4L IS USM Lens kit, the lens will was covered since it is included in the box with the body (also known as a “hard bundle”). For more information, check out Canon USA's CarePAK PLUS Promo page. A larger version of this image is available on Flickr, Google+, Facebook and 500px. If reading from a news feed reader, click through to see the framed image. Liz Kreutz loves the sport of boxing. The emotional accessibility of it and the action inside the ring gives her a buzz. Throw in some frenetic action and tricky lighting and the US-based photographer is in her element. Read the entire article and see the image gallery on the Canon Professional Network. B&H has the Canon EOS-1D X Mark II available for preorder. In this video, National Geographic photographer Bob Holmes gives us his lighting tips and the secrets for controlling light in your photographs. You'll learn about the 3 types of light and how to control each. Bob explains how to capture the shot using natural light without lots of equipment. He shares his decades of experience, knowledge and travels with you in this video. Lightroom CC 2015.5.1 and Lightroom 6.5.1 are now available. Our focus with this release was to add support for new cameras and also fix reported customer issues. Please note that on first launch of Lightroom CC 2015.5.1 / 6.5.1, you will need to log in to continue syncing images and metadata between desktop and your mobile devices. To sign in, click on the Activity Center in the upper-left corner and select the “Sign In” button. For more info see these detailed instructions. Lightroom for iOS v2.3 is now live as well. Check it out here! Image flickers when moving an adjustment slider. Note that this only occurs when using certain AMD graphics cards (such as 6450M and 6970M) on Mac OS 10.11 (El Capitan). We are working with our partners to resolve this issue. In the meantime, you can workaround this issue by disabling “Use Graphics Processor” in Lightroom’s preferences. Installation InstructionsPlease select Help > Updates to install the update. See Keeping Lightroom up-to-date. The Creative Cloud Photography Plan (Photoshop CC & Lightroom CC) is an excellent value at only $9.99/month. Have you ever wondered what ICC profiles are and how they can affect your prints? The Canon Digital Learning Center has just posted a primer on third-party ICC profiles. Camera Raw 9.5.1 is now available through the update mechanism in Photoshop CC and the Creative Cloud application. Our focus with this release was to add support for new cameras and also fix reported customer issues. Please note that this is the final version of Camera Raw that will work using Mac OSX 10.7 and OSX 10.8. Upcoming releases, starting with Camera Raw 9.6, will require the use of OSX 10.9 or later. Thank you for all your feedback and passion for Camera Raw. Image flickers when moving an adjustment slider. Note that this only occurs when using certain AMD graphics cards (such as 6450M and 6970M) on Mac OS 10.11 (El Capitan). We are working with our partners to resolve this issue. In the meantime, you can workaround this issue by disabling “Use Graphics Processor” in Camera Raw’s preferences. Please select Help>Updates to install the update. 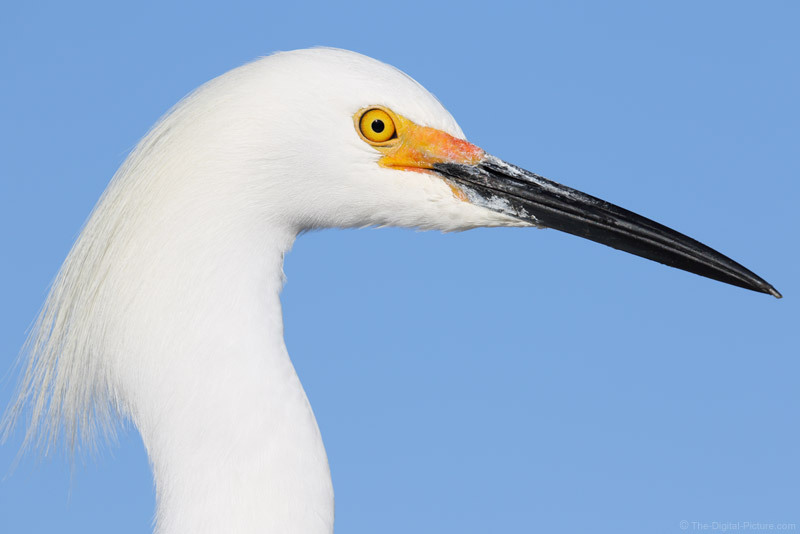 See Keeping Photoshop & Camera Raw up-to-date. 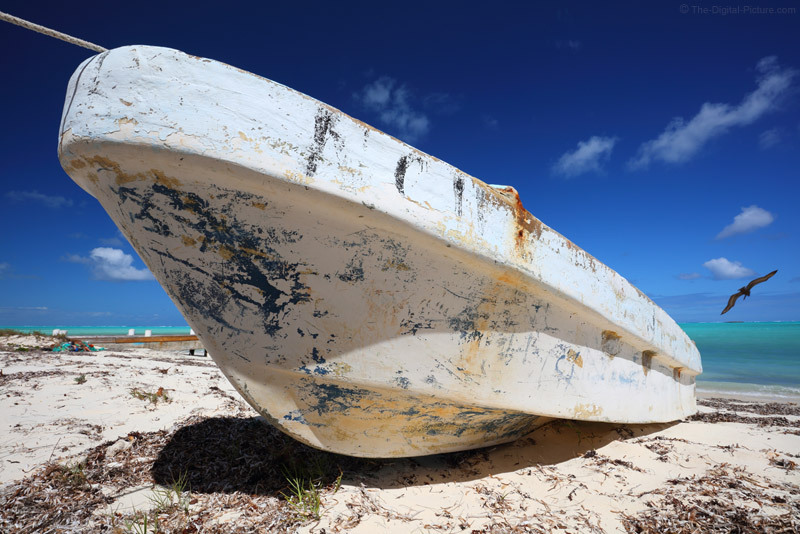 While exploring Middle Caicos, I came across this great little old boat on Bambarra Beach. I opted to go wide and move in close, emphasizing the boat relative to the rest of the landscape. As I worked the scene, I continued to move in closer and lower until ... cue the pelican ... I settled on this shot. The Canon EF 16-35mm f/4L IS USM Lens is a great beach and seascape lens option, with or without a tripod. Whether or not to use a circular polarizer filter when using the widest angles of this lens on a full frame body (and similar angle-of-view-equivalent focal lengths on APS-C format bodies) is a question that one must ask themselves. 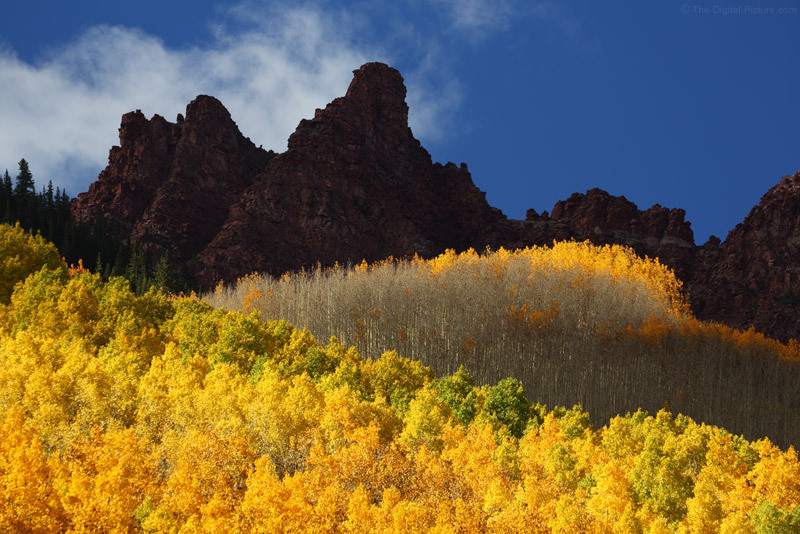 At very wide angles, a CPL filter can create an unevenly-darkened sky and tastes for such vary widely. One strategy is to shoot in the middle of the day. A high sun places the most-darkened portion of the sky evenly over the horizon. This provides a more-evenly darkened sky within the frame, as seen in this image. While there is some gradient in this sky, I much prefer the CPL look and the high sky-to-boat contrast over the lighter sky (which naturally has some gradient even without the filter). lf you're like me, you keep a catalogue (either mentally or on paper/electronically) of locations you'd like to photograph "...when the time is right." For many locations, timing is everything. Yet the opportunities for some types of photography are remarkably fleeting and/or rare. One such photographic endeavor where time is really of the essence is lightning photography. Typically speaking, lightning photography is optimally captured at night and the circumstances which make it ideal for capture sometimes catch you by surprise (for example, when you're sleeping). For instance, I've been awoken in the early morning hours by the distant sounds of thunder and immediately thought, "Now would be great time to capture a lightning strike featuring downtown Savannah, GA." Unfortunately, the last time this happened I was unprepared to rush out the door quickly. It took me about 15 minutes to gather all the items I thought I'd need to capture lightning, including double-checking battery and memory card capacities. As I was driving downtown, I saw the last lightning strike that the storm had to offer. The opportunity had slipped through my fingers. That got me thinking. What I really needed to do is prepare a "go-bag" that's ready at a moment's notice. So for the last two evenings where thunderstorms have been forecast, I've packed a bag before going to bed so that I can bolt (pun intended) out the door when necessary. For what it's worth, I carry the Canon TC-80N3 for redundancy; if the MIOPS trigger's internal battery becomes exhausted, or I'm photographing in a location that's too bright for the trigger to sense faint lightning, I'll use the Canon Remote Timer and simply fire the camera continuously using the intervalometer. When packing the bag, I always check to ensure my camera's batteries have a sufficient charge and that its memory cards are in place. 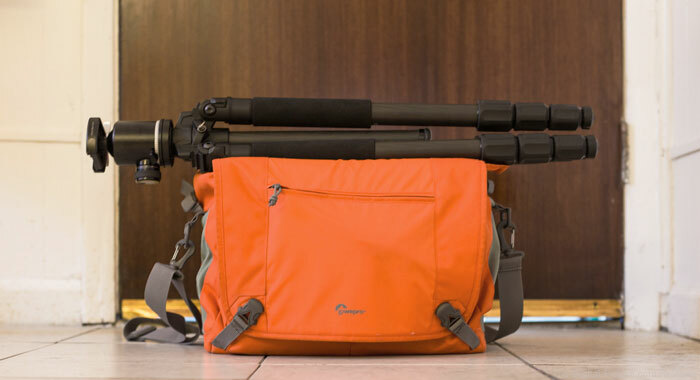 After that, I place my Induro CT-314 tripod (similar to this) on top of the bag so that I don't forget to take it as well. Preparing your go-bag well ahead of the time you actually need it has two very tangible benefits. The first is that you're able to get out of the door as quickly as possible. The second is that you're less likely to forget a vital piece of equipment because you aren't frantically rushing to get everything packed. Cloud and/or sunset photography are other endeavors that may benefit from a prepacked go-bag including a circular polarizing filter, step-up rings (if needed), and possibly a strong ND for longer exposures. If the sky is filled with interesting clouds or a beautifully warm, hazy sunset, just grab your bag and head out to your favorite location before conditions change (wherever that may be). Do you shoot bands in night clubs? Do you ever get calls 15-minutes before show time with requests to shoot a gig? Your go-bag would likely include several wide aperture primes and, maybe most importantly, earplugs. While having a go-bag prepared isn't necessarily advantageous for all photographic disciplines, it can really come in handy for those all-to-fleeting photographic opportunities where minutes matter. Dance Photographer Lois Greenfield shares with us her insight on how she captures movement and the beauty of dance. 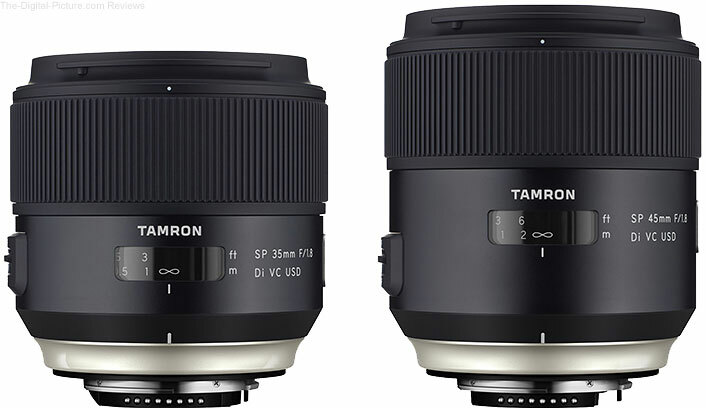 April 28, 2016, Commack, New York – Tamron Co., Ltd., a leading manufacturer of optics for diverse applications, announces that its SP 35mm F/1.8 Di VC USD (Model F012), a fast aperture wide-angle lens, and SP 45mm F/1.8 Di VC USD (Model F013), a fast aperture standard lens, both of which were launched in September 2015 as lenses compatible with full-frame DSLR cameras, have now won the "iF Design Award 2016" and the "Red Dot Award: Product Design 2016." While the lens is constructed with the absolutely most modern technologies inside, the exterior is articulated to offer the best possible comfort and confidence under a product design philosophy of "Human Touch." Organically composed lines and patterns on the barrel produce subtle changes in its appearance by reflecting ambient light on the surface. Metal-based barrel materials provide a pleasant feeling of comfort, high quality and durability, fitting firmly in the hands of the photographer. Design of the front face of the lens is also taken into consideration so that it is not intimidating. A brand ring that's tinted "Luminous Gold" adorns the lens just above the lens mount. On one side of the lens barrel there is an SP emblem in the same luxurious color. The window over the distance scale has been enlarged by 20% to maximize visibility and legibility. Font style of the characters and numbers has been newly developed to enhance the legibility as a critical element of the overall product design. The geometric shape and sliding torque of the AF/MF change-over and VC On/Off switches have been configured and engineered to deliver the utmost comfort with secured operational feedback. To complete the lens product design, accessories such as the lens hood and caps for front and rear have been totally redesigned as well. Attaching and removing the lens hood has been fine-tuned by optimizing the connection interface to render both secure seating and durability. B&H carries the Tamron 35mm f/1.8 Di VC USD and 45mm f/1.8 Di VC USD lenses. Introducing the First-Ever Filter Replacement Warranty! Things break. And when they do, the cost to replace them is never pleasant. Heliopan UV and Protection Filters are meant to always be on your lens. They help protect your lens from damage. We want to protect you and your investment. 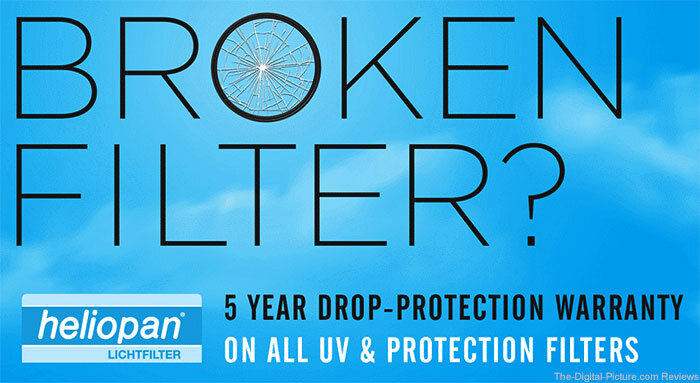 Heliopan is pleased to offer a one-time replacement warranty for any UV or Protection Filter purchased new from any of our authorized US Resellers. Proof of purchase in the form of a dated bill of sale with the name and address of the reseller is required. If you recently bought a Heliopan UV or Protection filter, this offer will be valid on purchases dating back to January 1, 2016. Use it. And if it happens to break in the line of duty, replace it. No problem. In this video we share some simple tips and tricks on how to mic talent for video shoots using lav microphones, including some clever ways of hiding or concealing your mics.